YA Bliss: A Thunderous Whisper Blog Tour: Interview with Christina Diaz Gonzalez & Giveaway! 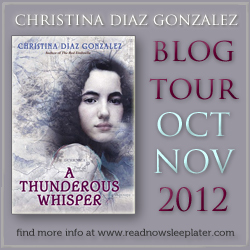 A Thunderous Whisper Blog Tour: Interview with Christina Diaz Gonzalez & Giveaway! 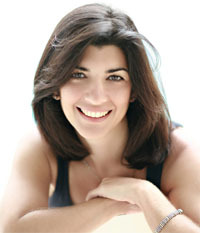 Writers often consider themselves as "character" or "plot" writers. Which would you say you are? I am definitely a character writer. I can come up with some crazy plots, but if there aren't strong characters to carry the story through...I quickly lose interest in writing about it. Why did you choose to write Historical Fiction for Teens? I don't think I make the conscious decision to write historical fiction as much as the stories choose me. If you've seen Elizabeth Gilbert's TED talk, you'll understand why I say that it all depends on what my muse (aka genius) decides to share with me. Is there a particular time period that appeals to you more than others? Every time period interests me...past, present and future! I never know where my next story will come from or when inspiration will strike. What recent historical fiction novel would you say stands out from others in the genre? These aren't too recent, but I love Markus Zusak's The Book Thief and Carlos Ruiz Zafon's The Shadow of the Wind. I love to write at a local Starbucks or at the cafe of my local indie bookstore, Books & Books. Both have great hot chocolate! Which of your characters is more similar to you? In A Thunderous Whisper, I used a lot of the emotions and feelings I had when I was fourteen and the new kid in school to develop the main character of Ani. In fact, I wrote a letter to my teen self regarding this for the blog "Dear Teen Me". Do you have another book in the making? I do, but I can't talk about it because I just started writing it and don't want to jinx it! What do you want readers to see in your books? I want them to recognize versions of themselves (or people they know) even though the characters may be from different countries or living in a different time. Good stories can transcend time and cultures! Now one lucky winner gets a copy of Christina's awesome book, A Thunderous Whisper! Open to US residents and ends Nov 1st, 2012.